Complimentary pick-up and drop-off available between GIA’s laboratory in Mumbai and locations within Mumbai (BDB), as well as Ahmedabad, Surat, Jaipur, New Delhi, Kolkata, Hyderabad, Coimbatore, Thrissur and Chennai. All stones outside service criteria will be charged 13.00 INR per stone. The submission minimums listed above apply to Mumbai location only. To address concerns about synthetic and treated diamonds being mixed into parcels of melee, GIA has developed an automated system to analyse and sort melee-size diamonds quickly and accurately. 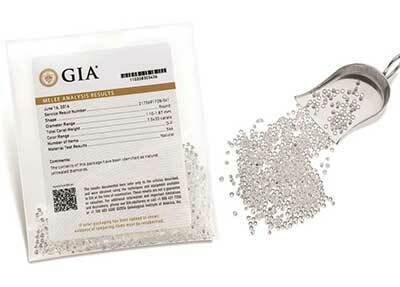 The GIA Melee Analysis Service separates natural diamonds from simulants, synthetic and HPHT treated natural diamonds, and sorts the screened diamonds by colour range. Clients can also specify a size range for their parcel. Once sorted, the melee will be sealed in secure packaging for shipment back to the submitting client.